Swakopmund is a coastal town in Namibia that sits about 225 miles west of Windhoek. 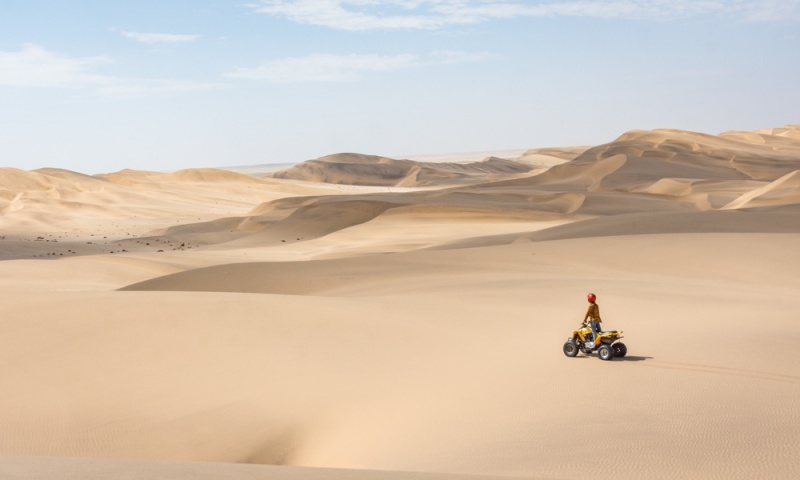 Sandwiched between the massive Namib Desert and the South Atlantic Ocean, this charming little town offers plenty of outdoor adventures to keep visitors entertained for several days. It’s a must-see destination when touring this beautiful country. 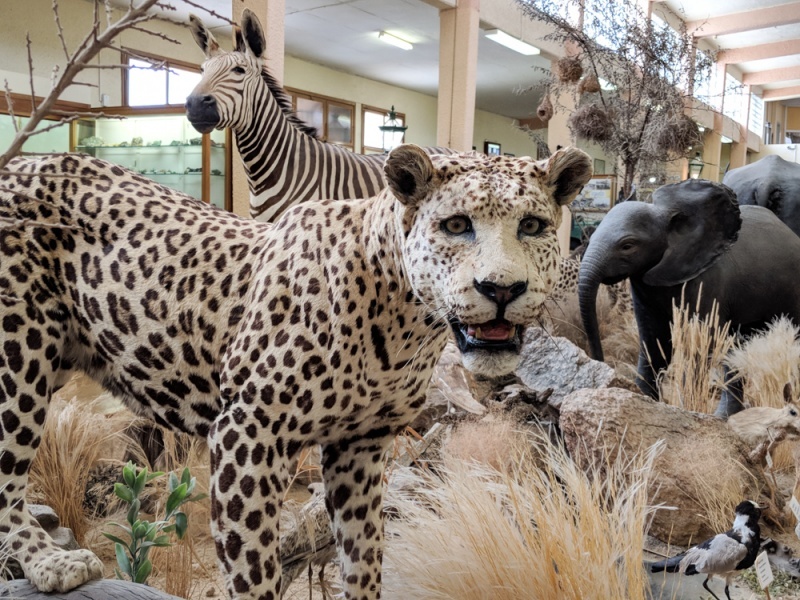 Don’t miss the top 12 things to see and do during your visit to Swakopmund! Namibia accepts two kinds of currency: the Namibian Dollar (NAD) and the South African Rand. However both do not hold the same value in South Africa so be sure to convert your currency from NAD prior to leaving the country. At the time of writing (March of 2018) the exchange rate was 11.79 NAD to $1 USD. So if we say that something costs 100 NAD that’s just about $8.35 USD. English is the official language of Namibia but there are more than 11 languages that are indigenous to the country and more than 49% of the population speak Oshiwambo. It is very common for Namibians to speak two or three languages. Most people you’ll encounter will speak English. Tipping is commonplace in most tourist areas of Namibia. Expect to give a “car guard” 2-3 NAD if you are making a quick trip or 5 NAD if you plan on being away from your car for an hour or more. 10% at restaurants is customary if you are satisfied with your service. Visitors from the United States, South Africa, Australia, Germany, Canada, Japan, and the UK qualify for a 90-day visa on arrival. Check your visa requirements here. The climate in Namibia is pleasant year-round and can be visited pretty much any time of the year. The dry season is May to October and if you are interested in seeing wildlife that is the best time of the year to plan your trip as the animals will gather around the watering holes. 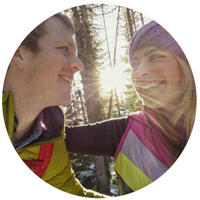 However July to October is high season so you will need to book your car and accommodations well in advance. The wet season is between December and March although Namibia receives far less rain than it’s neighbors. Animals will be more scattered throughout the parks during the wet season which lowers your chances of spotting them easily. April and May experience very moderate temperatures with little or no rainfall and October to February can be very hot. Traveling in the off-season is recommended as the weather is pleasant and there are far fewer crowds to contend with. Swakopmund is located about 225 miles west of Windhoek which is the airport that most visitors fly into. The drive from Windhoek to Swakopmund will take about three and a half hours. Driving in Namibia is easy, and all the roads are paved between Windhoek and Swakopmund so you won;t need a 4×4 for this stretch. Namibia is an incredibly safe country (even if you’re traveling alone in Africa), however, the increase in tourism over the years has also brought an increase in car theft. Rental car smash and grabs can be common in cities when tourists leave valuables in plain sight. This is rare but not uncommon in Swakopmund. Many young entrepreneurs wait in busy parking lots with an offer to watch your car for a small tip which is worth paying for added security. Expect to give them around 2-3 NAD if you are making a quick trip or 5 NAD if you plan on being away from your car for an hour or more. Tipping in Namibia is expected so keep small change on you at all times. Expect to tip around 10% in restaurants, 5-10 NAD for your gas station attendant, and around 5 NAD to the person bagging your groceries at the supermarket. Also be sure to tip your hotel staff and any tour guides during your stay. The World Health Organization and Centers for Disease Control recommend getting the following standard travel vaccines prior to visiting Namibia: Hepatitis A and B, Typhoid, and Yellow Fever. The risk of contracting malaria in Swakopmund is low year round. The side effects of pills that protect against malaria are often worse than the disease itself and are generally not recommended. Read about everything you need to know about renting a car in Namibia here! The Villa Margherita is the most darling antique colonial boutique hotel located in the heart of Swakopmund. With just 10 incredibly large and beautifully decorated rooms, every guest will receive personalized royal treatment from the attentive and helpful staff. 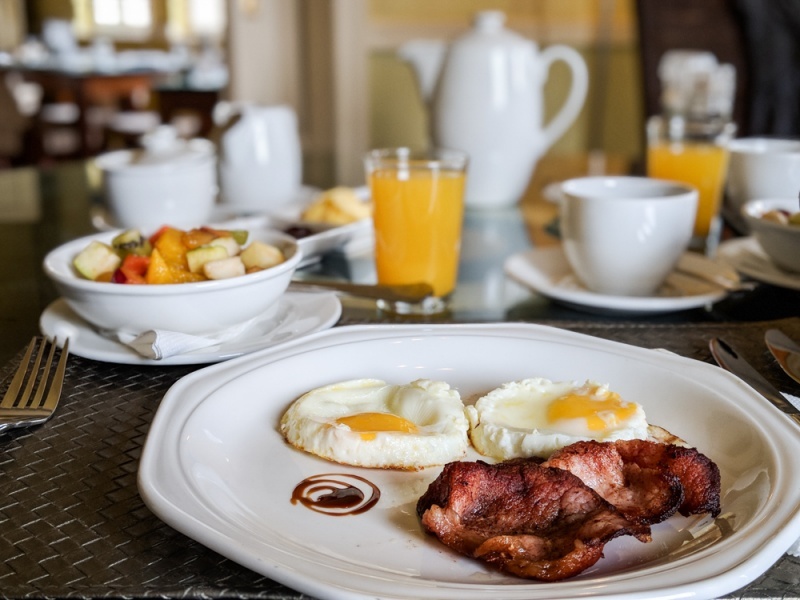 Start your day with the delectable breakfast menu offered daily from 7:00am until 9:00am and then relax in one of the many comfortable seating areas throughout the villa or out in the peaceful garden. Soft bluesy music fills the rooms of the villa and you’ll find that you feel right at home here. Arrange to have a full-body massage during your stay. It’s the perfect way to unwind after spending several days in the car touring Namibia. And while you should certainly sample all of the amazing cuisine options in Swakopmund, be sure to try the fresh fish at the Villa Margherita for dinner at least once. Their dinner menu and wine list is superb! The helpful staff at the Villa Margherita can also help you to arrange all of your activities during your stay in Swakopmund! Stretching from Swakopmund all the way to Angola, the Skeleton Coast has been called both “the land God made in anger” and “the gates of hell”. Sadly many ships have wrecked along this desolate coastline over the years, notably the name was coined by the author of the book chronicling the Dunedin Star shipwreck in 1942. The current here is strong and scattered along the shore are the remains of both animal skeletons and ship remains. And because this area of Namibia is so forbidding, it is also one of the most pristine coastlines in the world. You will be in awe of the views along your drive up the C34 highway. Why stick to the land when there is so much fascinating marine life in view right offshore? Enjoy some fresh, delicious oysters and bubbly champagne while cruising around the South Atlantic ocean with stunning views of the shore. You’ll likely spot seals, pelicans, or even whales or dolphins if you’re lucky. It’s the perfect way to spend a morning in Swakopmund. The dunes of the Namib Desert overlook the sea below and extend for miles in every direction. And the best way to take a tour of this vast sandy wasteland is speeding through it on a quad bike! Don’t worry about safety – you’ll have a guide and a helmet and they’ll take care to ensure that you travel at speeds that you’re comfortable with. Cost: 450 NAD/person for 1 hour, 550 NAD/person for 1 1/2 hours, and 650 NAD/person for a 2 hour tour. While the Skeleton Coast is incredibly harsh and bleak, from the air it is nothing short of spectacular! The massive and imposing sand dunes begin at the shoreline that is continuously pounded by crashing waves. It is truly the best way to view this region of Namibia. Helicopter flights vary in length and you can choose between several scenery options. The most popular flight travels south along the coast to Sossusvlei and back again. Cost: 4,400 NAD/person for a 2 hour flight. 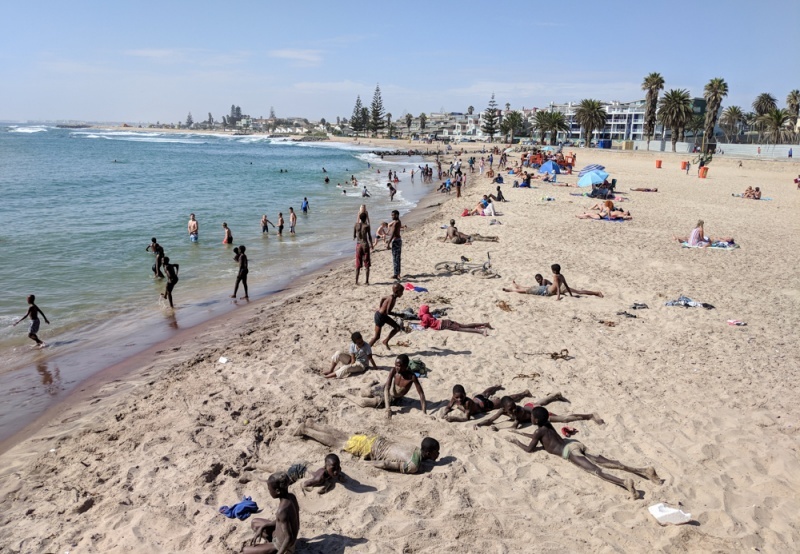 The public beach in Swakopmund is filled with tourists and locals alike having a great time lounging in the sand and taking a dip in the ocean. And with plenty of restaurants close by, it’s the perfect way to spend an afternoon! Wander down the boardwalk as well to find your own quiet spot if the beach right in the center of town is too rowdy for your liking. You’ll find the freshest seafood in all of Namibia is served in Swakopmund so you cannot leave without sampling the local catch. Or better yet, head to the ocean and try your hand and hooking your own dinner! You can choose to try your hand at fishing from the beach, off a boat, or go deep sea fishing (only offered from October to February). Cost: Prices range depending on party size. The price for fishing from a boat starts at 1,000 NAD/person. This random private collection of Namibian history is definitely worth checking out while visiting the area. A vast array of taxidermy is on display as well as a very detailed explanation of the various indigenous groups that inhabit the country. Plan on spending at least an hour learning about Namibian history, culture, wildlife, and geology. You’ll find the best cuisine in all of Namibia in this darling town! And because there are so many options to choose from, picking a spot for dinner can be daunting. You’ll find plenty of German-inspired cuisine, fresh seafood, specialty pizzas, and everything in-between! For fresh seafood and perfect wine pairings, dine in at the Villa Margherita Restaurant. For unique pizza combinations don’t miss Bits N Pizzas. Village Cafe is the perfect spot for a delicious breakfast in a fun, casual atmosphere. For comfort food with stunning views of the sea, head to Farmhouse Deli. 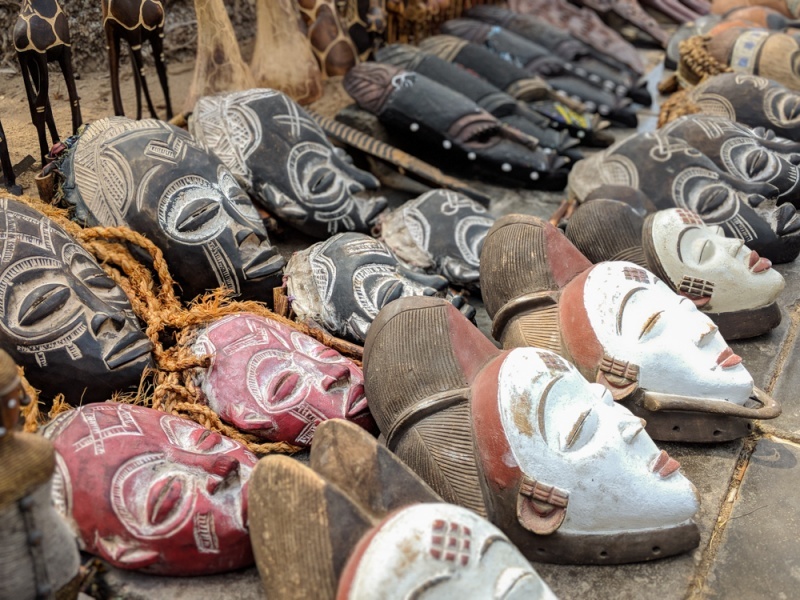 If you are looking to bring home any traditional carvings from Namibia, you’ll find plenty to choose from in the outdoor craft market in the heart of the city. You’ll even spot a few women from the Himba tribe offering handmade jewelry and the opportunity to snap a photo of them for a price. The largest employers in Swakopmund produce uranium, beer, and salt. So it’s imperative that you sample the goods! Not the uranium, the beer of course. Brewer & Butcher has plenty of outdoor seating and a beer sampler so you can try before you commit. 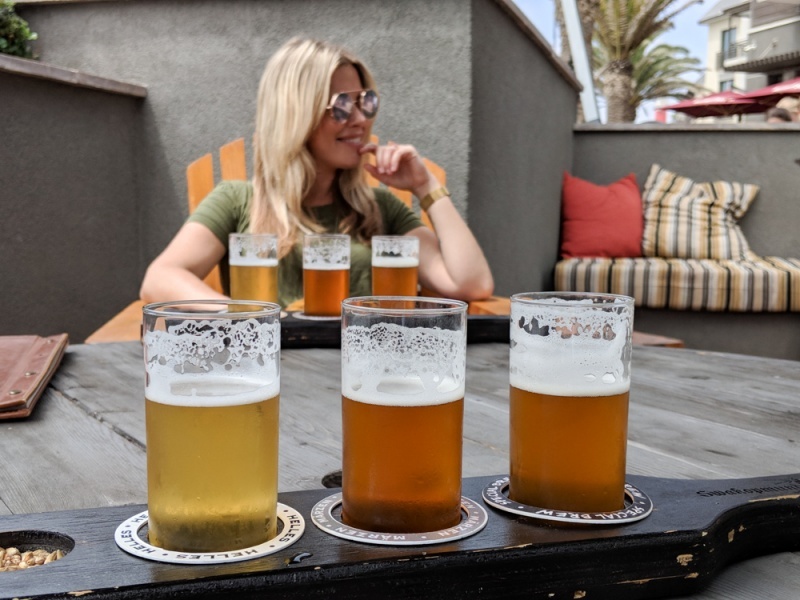 The Helles is our favorite – light, refreshing, and perfect for day drinking. 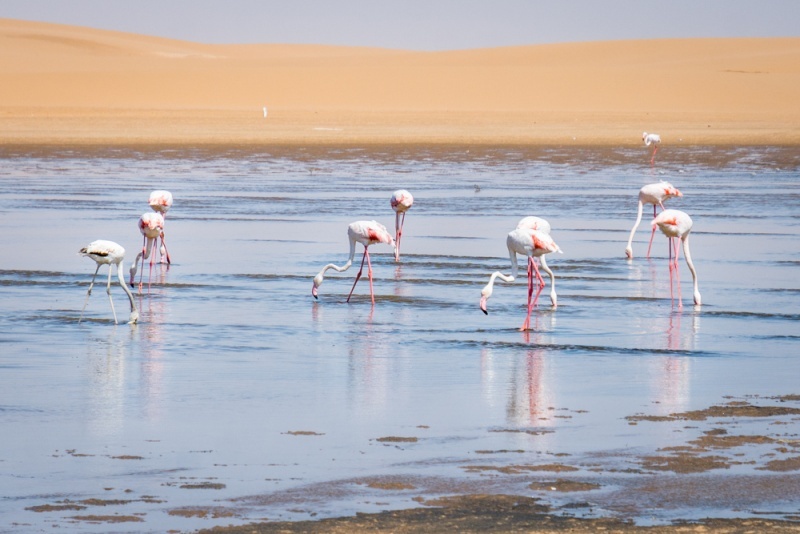 You’ll find thousands of flamingos hanging out in the shallow waters of the Namib Desert coast, and Walvis Bay is a particular hot spot for these beautiful birds. And being that the bay is just about 20 minutes south of Swakopmund, bird enthusiasts and amateur photographers will rejoice! The flamingos prefer to congregate in three areas; the lagoon located southwest of Walvis Bay, near the Salt Works complex which supplies over 90% of South Africa’s salt, and Bird Paradise which is a sanctuary for the birds. 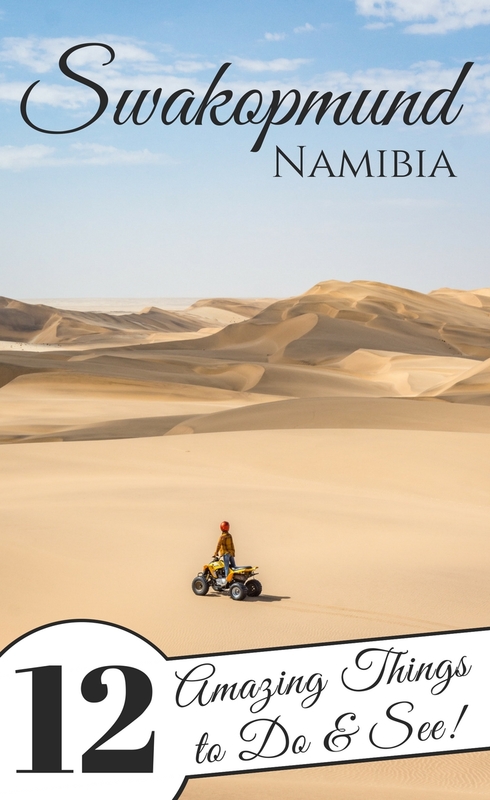 And lastly – get to know the amazing Namibian people that call this area home!